When people think of teachers and instructurs I feel they often think of very experienced teachers. There is of course nothing wrong with this but I think there is value to be teaching harmonica even as a beginner, or rather a slightly more advanced beginner. In this article I will outline my thought on the benfits for the student and the teacher when the teacher is not very experienced. Let’s start with some obvious drawbacks. An inexperienced teacher will of course be unfamiliar with some of the more advanced techniques. If the student want to progress very quickly he or she may feel held back. Also the teacher may feel inadequate when teaching harmonica as a beginner. If this is enough to discourage the teacher or the student is a matter of personal preference. I find that one of the things that is most valuable to be as a teacher is that I need to explain what I do. That extra effort you need to put in to explain what you recently learned to explain to somebody else can be really beneficial for your own learning. Teaching is also a great driving force to keep developing yourself. If your student(s) are not that much more inexperienced that you, this can be a strong driver. Learning from a seasoned pro can be intimidating for some people. A less experienced teacher can definately be a plus if you feel that way. The fact that the teacher was learning the same thing not long ago can also work in favor of the student. It is easier to remember what was hard when the experience was not that far back. The teacher can be seem more as a fellow explorer of the instrument. What about a combo for teaching harmonica? It is of course up to each and everyone to decide who to learn from. However I feel that the idea of beginning teacher should not be too easily discarded. Especially when you live in an area where there are no experienced teachers. The combination of a slightly more advanced beginner teaching harmonica in combination with online teaching such as Bluesharmonica.com can be a powerful combination. This is also good for the teacher as you can get great material that way (both need to be members of course). I hope you see that there can be value in both teaching as a beginner and being taught by a beginner. The diatonic harmonica is a very interesting instrument. It produces sound both when we are breathing in and we are breathing out. However if you are interested in blues, the bluesiest sounds are available when breathing in (second position for example). As human beings we are very good at taking air into our lungs but we are not very comfortable keeping the air out. This fact is what causes a lot of the common breathing problems for harmonica players. In this article I point out these problems and suggest how you might solve them. There are basically two main categories of breathing problems for harmonica, not getting rid of air and filling up on air too quickly. In the end both categories result in the same thing, your lungs being filled with air and you being very tense. Joe Filisko talked a lot about this in his class at Harmonica Masters Workshops 2018. By far the most common of the breathing problems for harmonica when filling up too quickly is breathing in through the nose. When you breathe in through the nose you take in air that does not contribute to your playing. It is basically waste. To fix this you first need to become aware of that you are doing it. Set your focus on your nose and play for a while, can you feel any air going in through your nose? If so you need to practice not doing that. A nose clamp is a good place to start. When you can play comfortably with a nose clamp, try removing it and see if you have rectified the problem. This will take time, but it is really essential to get right. Another problem may be that you are leaking air in around the harmonica. If this is your problem you need to practice in front of a mirror and try to locate where the leak is. Make sure that your lips form a tight seal around the harmonica. This is especially common if you have just taken up tongue blocking. If you are not taking in air throught the nose or leaking air around the harmonica and still fill up too quickly, you may be playing too hard. Practice playing both softly and hard to get used to both “gears”. In practical situations don’t play harder than you need to. Save your breath for when you need to be louder. As we want to play as many in notes as possible to get the bluesiest sound we need to figure out ways of getting rid of air. The first thing we can do is make sure that we don’t start playing with out lungs half full (may also be a reason for filling up too quickly). When we are relaxed after breathing out are lungs are not empty, they are actually about half full. Try first breathing out until you feel relaxed and then really push out all the air. You will notice that there is quite a bit of air still to get rid of. It is a good idea to get into the habit of first pushing out all the air before you start playing a phrase, especially if it is a long phrase with lots of in notes. You also need to be mindful of not taking a breath immediately before placing th ahrmonica on your lips, this is a quite common error. The next step to solving these breathing problems for harmonica is to find spots in the music where you can dump air. If there is a pause between phrases, simply take the harmonica out and push the air out without it going through the harmonica. You can also use any out notes and breathe out through the nose at the same time (out is OK but not in). This will make playing a long passage of in-notes a whole lot easier. To help with most of the breathing problems for harmonica above there is a great exercise you can do easily. Start by pushing all the air out of your lungs, pause for a brief moment before slowly letting the air in again through your mouth. Experiment with your breathing here. This will allow you to notice how you are breathing and how quickly you fill up. You will feel some discomfort that you can get use to but you please make sure not to cause dizzines or blacking out. The idea is to get use to some discomfort and teach your body that it doesn’t have to get air in as fast as possible. Basically if you can teach your body to slowly take in air through the mouth and quickly push aor out throught the nose when possible you will have solved most common brathing problems. This will result in a big improvement in your playing. I am a left handed harmonica player and when I started playing there was nobody around to guide me. This meant that I had to figure out a lot of things myself. Unfortunately some of the decisions I made in the eighties later turned out to be less than optimal decisions. I have later changed the way I hold the harmonica and my embouchure for example. 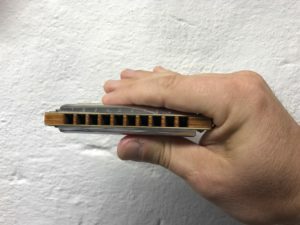 To help any left handed player out there (and right handed) this article covers the options you have when holding the harmonica. To keep things short and sweet I focus on two things, the hand holding the harmonica and if hole 1 on your diatonic harmonica faces left or right. What felt most natural to me when I stared playin and what seems to be most natural if you are a left handed harmonica player is to hold the harmonica in your right hand with hole 1 to the left. Most right handed players opt for left hand and hole 1 to the left. There are of course two other combinations as well to look at. Let’s start with the one that felt most natural to me. In this case the right hand holds the harp and your left hand is used for hand effects. It is certainly a playable position but there is one major drawback. Holes 1-3 which are the low pitched holes are the ones that get most effect from hand cupping effect and this way of holding basically removes this option. This is the reason I abanded this way oh holding. If you primarily play through a bullet mic and have a tight cup this may be less of an issue for you. This way seem to be what most left handed players choose by themsleves. To remedy the drawback of the previous way you can simply turn the harmonica upside down. This way you can still hold with your right hand and have a cup over the lower pitch holes. This is the way Sonny Terry held the harmonica, definately an option if holding with your right hand is important to you. Just remeber that you have to flip all instructions you find online and your toung will be to the right most of the time while tounge blocking. Holding the harmonica upside down but with the right hand allows for cupping around low pitched holes. 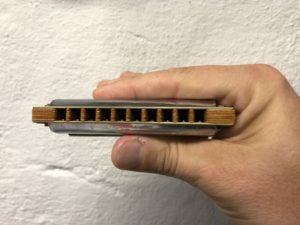 This is not a way I would recommend, using the left hand to hold but having the harmonica upseide down has the same problem as the first option I presented. There is really no need for this. This is the way most right handed players naturally pick up the harmonica. The harmonica has the numbers facing up so you can read them easily and your hand cup naturally covers the low pitched holes. Even if you are a left handed harmonica player I would recommend you to switch to this way if you can. Most things regarding instructions and so on is simpler this way. Suggested holding style, also note position of thumb and index finger. Allows for more natural position of the elbows. Of course the recommendations above may be null and void for you if you have any physical challenges that prevents you from holding like this. In that case you should o what works best for you and find your own way. If you do decide to change the way you hold the harmonica, let me know how it works out for you. I remember feeling a bit awkward for a few weeks before it became natural to me. One of the most infected debate in the harmonica world is the pucker vs tounge blocking debate that has been going on for ever. This article is not meant as fuel for that debate although I am a tounge blocking advocate since a number of years. What I would like to do with this articel is giving you a good foundation start tounge blocking for single notes. I find that some people stay with puckering just because they don’t know how to change. First of, let’s just define what tongue blocking is. 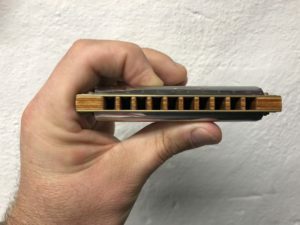 It is the embouchure where you place your mouth over three or four holes on the harmonica and then use your tongue to block the holes you don’t want to play. What you end up with is one (or more) holes that gets all the air throught the corner of your mouth. You can actually play out of both corners for the octave split but let’s save that for later. To get a good a start tounge blocking you need to be able to control your tongue. This is quite hard for most people as we use our tounges sub-consiously every day. I find that the best way is to start by blocking all the holes at once so that no sound comes out at all. It may sound counter intuitive but it is actually a very useful technique as a base for more advanced techniques. To effectively block all holes you will notice that the tip of the tounge is not wide enough, point the tip slightly downwards and let the top of the tip block instead. Block all holes with the top of the front part of the tongue. The next step is to open the air flow for one hole. You do this by ever so slightly slide your tongue to the left. This will open up a hole in the right corner of your mouth that will allow air to pass through one of the holes. Don’t worry too much if you get more than one hole to begin with but spend some time finding the sweet spot where you only get one hole. Basically that is it, this is how you start tounge blocking. The sound you hear should be unobstructed and relaxed, no bend in the pitch a full tone. Use the process I outlined before on how to learn new techniques. Slide the tongue to the left to allow air to pass through. You are probably using too much of the tip of the tounge, curve your toung downwards a bit more to use more of the top of the tounge. It is also a good idea to tilt the harmonica slightly downwards to more easily meet the top of your tounge. You may also be opening your mouth too wide, try narrowing it a bit to cover three or four holes. No more now. In this case you are likely blocking with the side of your tounge, focus on holding the harmonica directly in front of your mouth no tilt. It is also likely that you have tried compensating for not curving your tounge downwards enough by tilting the harmonica. Go back to practicing the full block until you can hold the harmonica with no tilt. If you feel that you are unable to control the tounge it is probably because you have no visual cues to build a picture of what is going on. In this case practice blocking all holes without the harmonica standing in front of a mirror and then sliding your tounge to the left. Seeing what you are doing will help you control your tounge and understanding how it should feel.You can also get the Filisko Tongue Block Trainer to get a more complete picture of what is happening. Once you start tongue blocking I would recommend you to try to play as much as possible with this embouchure. You may need to relearn some songs you have played before but I think it is well worth the effort. Did my first 1-on-1 lesson yesterday as a harmonica teacher. Felt good. Next one on Tuesday. As of today I am officially an accredited harmonica instructor through Bluesharmonica.com. If you would like lessons, contact me!